ROK and US defense authorities recently held the 4th ROK-US Integrated Defense Dialogue (KIDD) and discussed increased North Korean nuclear threats and related security issues, including postponement of wartime operational control (WOPCON) transition, which is scheduled for December 1, 2015. The transition of WOPCON was first requested by the Roh Moo-hyun government at the ROK-US Security Policy Initiative (SPI) meeting in September 2005, and in February 2007 the two governments agreed to a transfer from the commander of the ROK-US Combined Forces Command (CINC CFC) to the chief of the Joint Chiefs of Staff of the Republic of Korea on April 17, 2012. The two seemed to be optimistic about denuclearization of the North through dialogue, stabilizing peninsular security, even though North Korea exploded its first nuclear device in September 2006. After the inauguration of the Lee Myung-bak government denuclearization looked more difficult. A North Korean soldier shot a South Korean tourist at Mt. Kumgang to death in July 2008. North Korea’s second nuclear explosion occurred in May 2009, and it refused to resume the Six-Party Talks and inter-Korean dialogue, while increasing military provocations to the South near the Northern Limit Line (NLL) in the West Sea. Under these unstable circumstances, presidents Lee and Obama in June 2010 agreed to delay the WOPCON transition to December 1, 2015. Despite sanctions by the international community due to its long-range missile launch and nuclear explosion, in December 2012 and February 2013, respectively, North Korea further aggravated the security situation. In early 2013, it boasted about its new capacity to attack Washington, D.C. with nuclear-tipped long-range missiles. In March, it increased military tensions on the peninsula to their highest point since the end of the Korean War by nullifying the six-decades-old armistice agreement and delivered Military Readiness Order #1 to all North Korean People’s Armed Forces. In April, it test fired a Multiple Rocket Launcher (MRL), which can target bases of the USFK in Pyeongtaek and Osan and the ROK army, navy, and air force headquarters in the Daejon area. North Korea also deployed new tanks equipped with ground-to-air missiles, which can shoot down old South Korean Cobra helicopters equipped with wire-guided anti-tank Tow missiles. As North Korean military threats further intensified in both Weapons of Mass Destruction (WMD) and conventional weapons, South Korean Defense Minister Kim Kwan-jin and the US Secretary of Defense Chuck Hagel at the Asia Security Summit (Shangri-la Dialogue) on June 1, 2013, discussed delaying the WOPCON transition. WOPCON is the core element in a Korean contingency. The ROK-US CFC will lose its rationale without it, as the ROK armed forces and the USFK implement independent operations with their own commands, weakening combat capabilities and removing the strongest mechanism to deter North Korean armed provocations. 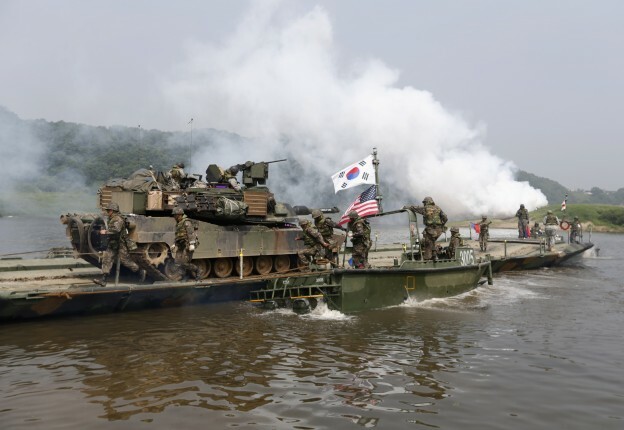 This Topic of the Month commentary discusses the meaning of the WOPCON transition for South Korean security and argues that further delay in the transition is inevitable. If strains were to arise in making this decision, they would be harmful to the alliance, due largely to the opposition in South Korea that sees this as a matter of sovereignty. The WOPCON transfer must be decided according to the situation on the Korean Peninsula. Unfortunately, the Roh and Lee governments approached it as a timing issue, not as conditional on a situation in which a stable peace has been achieved on the basis of mutual confidence between North and South Korea. If they had made the WOPCON transition conditional, the rescheduling issue would not be on the agenda. What triggered calls for a second postponement? The WOPCON transition must be decided according to North Korean threats, South Korean capabilities to deter the threats, and US supporting capabilities as an ally. First, although South Korea and the United States agreed to delay the transition after the Cheonan sinking in March 2010 and the subsequent military tension, the security environment on the peninsula is still unstable, as seen in threats to use nuclear weapons as in warnings of a “sea of fire in Seoul” as well as a “sea of fire in Washington, D.C.” On July 21, 2013, the Rodong Shinmum reported that North Korea has already succeeded in miniaturizing and diversifying its nuclear weapons, and possessed both hydrogen- and neutron-bombs in addition to atomic bombs. Though these claims are not verified, its WMD threat has become more serious. North Korean long-range artillery and tanks pose a serious threat. Seoul is located merely 50km south from the DMZ, and almost 50 percent of South Korea’s population resides in the Seoul-Incheon metropolitan area. Considering this vulnerability, the South must reinforce its military forces for sufficient deterrence against the North before the WOPCON transition. Unfortunately, South Korea’s defense budget has not been enough to deter North Korean armed provocations, and its command structure also is not effective in maximizing its war-fighting capabilities. Roh Mu-hyun’s plan for establishing an independent defense capability in Defense Modernization 2020 assumed 7.1 percent economic growth and 9.9 percent defense budget increase every year from 2006 to 2020. Due to the world financial crisis, both rates have fallen far below the plan. Therefore, the Lee government postponed the target year for an independent deterrence capability to the North from 2020 to 2030. The most serious problem is insufficient information acquisition capabilities. Though the South Korean military has some information gathering capabilities near the DMZ area, it heavily depends on the USFK, relying almost 100 percent for strategic information, about 70 percent for tactical information, and more than 90 percent for visual and signal information. Without close USFK information cooperation early warning of a surprise attack, in fact, is not possible. There is no assurance of US support in the same manner after the WOPCON transition, which would dissolve the CFC, which currently is responsible for deterring North Korean armed provocations, or that the United States would provide large-scale military support without the CFC. South Korea has neither deterrence capabilities nor effective measures to defend against North Korean WMD. The dissolution of the CFC means that there would be two independent commands, each carrying out its own military operations in a very small theater of operations on the Korean Peninsula, resulting in ineffective operations. Therefore, the two defense authorities have been discussing various alternatives for wartime cooperation, including establishment of a wartime cooperation mechanism and a joint theater command under a four-star South Korean general, alternatives deemed less effective than the current CFC. The South Korean defense budget is not enough to maintain an independent deterrence capability against the North. In addition, the South and the United States have not agreed on a command structure after the WOPCON transition. In these circumstances, it is unwise to hurry the transition before assessing the threats more carefully and the South exerting every effort to maintain an independent capability. The WOPCON is a core element in deterring and defeating North Korean armed provocations. Dissolution of the ROK-US CFC, could render the deterrent power of the alliance impotent. In the post-Cold War era, an alliance is the most effective way to maintain security against external threats. For South Korea, under intensifying WMD and conventional threats, maintenance of the ROK-US CFC is necessary to keep peace on the peninsula. The WOPCON transfer must be considered not as a timing issue but as a situation issue—i.e., inter-Korean relations, regional security environment, Sino-US relations, etc. Unless North Korea abandons its nuclear weapons and long-range missile programs and decreases military tension on the Korean Peninsula, it is difficult to expect peace and stability. The WOPCON transition before a significant change in the North Korean political system would likely increase instability on the peninsula. Talk about the WOPCON transition should wait until after North Korea abandons all WMD weapons and programs and changes its political system toward reform and opening. The transition must be postponed until North Korea behaves as a responsible member of the international community, South Korea maintains sufficient deterrence capability, and the key, concerned countries have a common understanding about stability on the Korean Peninsula. This issue should not be treated as a symbol of South Korean sovereignty, but as a test of the South Korean will to do what is necessary for its essential defense. 1. North Korea test fired from an advanced model of the Chinese MRL, WS-1, WS-1B, or WS-2 a total of six rockets, which flew 130-150km. 2. Chosun.com, May 20, 2013. http://news.chosun.com/site/data/html_dir/2013/05/20/2013052000185.html (accessed August 2, 2013); Segye.com, June 19, 2013, http://www.segye.com/content/html/2013/06/19/20130619004888.html (accessed August 5, 2013). Reviewing the recent posting by Chaesung Chun as well as earlier statements in the Topics of the Month series, one can find repeated expectations for Chinese behavior with little anticipation of the consequences should these prove wrong. As others, Chun calls for a more regional alliance orientation, which is precisely what China opposes. He acknowledges the danger of the range of South Korean strategic options becoming severely limited if Sino-US relations deteriorate, but the bulk of the analysis assumes a different outcome. A close look at Chinese writings on South Korea and on regional issues casts a shadow on the assumptions many are making. This rejoinder points to four problems: 1) overlooking the Chinese perspective on reunification and the future of the Korean Peninsula; 2) underestimating the impact of Sino-US polarization; 3) neglecting the significance of the Sino-Japanese standoff; and 4) evaluating China’s prospective policies without considering national identity. On the Chinese perspective regarding the peninsula, Chun calls for Washington to reassure Beijing about the limits of the alliance. This sort of reassurance presumably means clarifying that the alliance is only about restraining North Korean aggression. If so, how is this compatible with broadening the alliance, sustaining it after the goal of reunification is realized or even agreeing on a transition when aggression no longer is worrisome? Chinese sources make it clear that China is opposed to reunification on South Korean terms (absorption or regime change); China regards the ROK-US alliance as hostile to its interests; and China supports North Korea’s strategy of putting economic support first in order to bolster the regime, which would help to change the balance of power on the peninsula along with China’s rising clout as the primary outside force in shaping how reunification proceeds. The hope that Sino-US cooperation will prevail over competition runs counter to sober expectations nearly everywhere. It would be helpful to develop the notion of more limited options for Seoul, considering different scenarios for tensions or even conflict. To what extent will management of North Korea be separate from troubles elsewhere, even if some degree of consensus is reached on this one challenge? This question is in line with an approach that prioritizes analysis of realistic dangers over emphasis on scenarios that draw heavily on wishful thinking. Writings on Japan in South Korea have seemed hesitant to assess the broad impact of China’s change in approach in 2012. It appears to be widely assumed that Seoul can remain closer to Beijing than Tokyo without damaging US relations or paying a price in regional security. There is little mention of Japan in writings on the ROK-US alliance, despite continued US efforts to strengthen triangularity. Finally, the topic that might be most important for understanding prospects for the peninsula and the region is analysis of China’s national identity and how it is being reconstructed. Much is written about China as if its choices are unpredictable, rather than subject to close analysis, which should be part of the coverage of issues raised in discussions of many questions, including what are the prospects for ROK-US ties.